A Florida university campus has been left in shock after a threatening sentence was left scrawled on a whiteboard on campus, accompanied by a graphic drawing, WBBH reports. According to the report, the problematic image showed up about two weeks ago and the culprit is still unknown. The image was found at Florida Gulf Coast University inside Seidler Hall, which houses the College of Arts and Sciences and is open to the public. According to the report, the doors of the hall are usually unlocked and anyone can come and go as he or she wishes throughout the day and night. School officials and campus members believe the racist vandalism took place the night of Oct. 12. 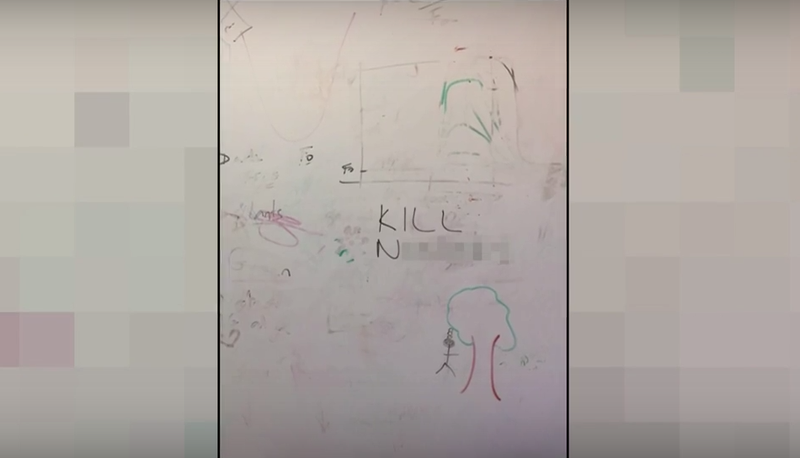 A faculty member discovered on a third-floor classroom whiteboard the hateful message, which depicted a person hanging from a tree by a rope with the message "Kill [n—gers]." However, according to Raw Story, the university Police Department announced this week that there would be no criminal investigation into the incident. University President Wilson G. Bradshaw released a statement Wednesday condemning the incident as "deeply disturbing." “While occurrences such as this are very rare at FGCU, we strongly condemn this hateful expression which is contrary to the civil and mutually respectful culture of our campus community,” Bradshaw said. Students, however, are still left reeling at the message. “The fact that it is in relation to the way I identify, yeah that’s harsh, that’s … kinda scary,” a junior, identified only as Cassie, told WBBH. “They’re talking about killing a certain race, so it’s not something that should be taken lightly in my opinion,” another student, Brielle Conner, said. Read more at WBBH and Raw Story.